The Worcester man charged with throwing a 7-year-old girl off a Lake Quinsigamond bridge on Aug. 27 was indicted on attempted murder, kidnapping and strangulation charges. A grand jury handed up the indictments Jan. 25, charging Joshua Hubert, 36, of 3 Bernice St. with two counts of attempted murder and single counts of kidnapping a child under 16 and strangulation or suffocation. He was arraigned Monday, Jan. 29, in Worcester Superior Court. He was being held on $2 million bail after being arraigned on kidnapping and attempted murder charges in district court. Worcester County District Attorney Joseph D. Early Jr. said that Mr. Hubert was a friend of members of the victim’s family and was at a cookout with them on Aug. 26. He allegedly put the girl in his car in the early hours of Aug. 27, strangled her and threw her off the I-290 bridge over Lake Quinsigamond. The girl survived the fall, swam to shore and sought help at a nearby home on the Shrewsbury side of the lake. 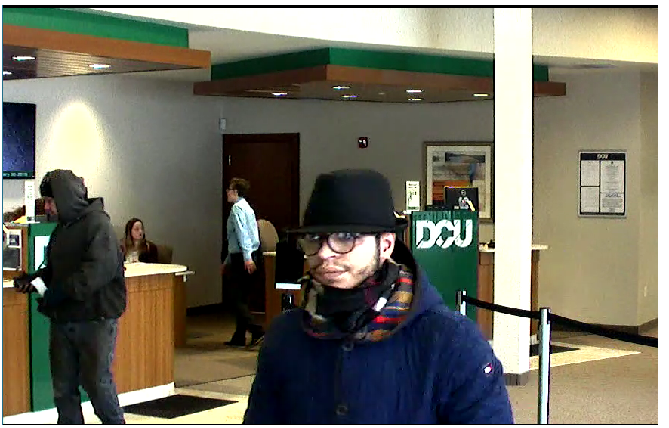 Worcester Police Department investigators are trying to identify a suspect in an unarmed robbery of the Digital Federal Credit Union that occurred on Tuesday, Jan. 30, at 11 Tobias Boland Way. A Hispanic male with a beard, approximately 5 feet, 5 inches tall, approximately 150 pounds, wearing a dark hat, scarf, and a dark colored jacket, approached the counter and slid a note toward her. The note demanded cash and contained threats. The clerk gave an undisclosed amount of money to the suspect. Police ask anyone who can identify the suspect to contact the Detective Bureau at 508-799-8651. On the evening of Jan. 29, Worcester Police found a dead man at 4 Valley Hill Drive. Justin Ramos, 27, was reported missing after last being seen at a party on Jan. 7 on Valley Hill Drive. Xavier Broughton, 32, of 4 Valley Hill Drive, was arrested for disinterment of a body and misleading an investigation. The investigation is ongoing. Worcester Police responded to ShotSpotter reports of gunfire on Friday, Jan. 26, and Sunday, Jan. 28. At about 11 a.m. Jan. 26, police responded to a report of several rounds fired in the area of Derby and Dearborn streets. Officers found several shell casings in the street and a vehicle that was struck multiple times. Then, at about 5 a.m. Jan. 28, police responded to 477 Park Ave.
Officers found several bullet holes in the windows of some businesses. Police also saw that several windows to another business were smashed out and a rear door kicked in. Neighbors said two men wearing dark sweatshirts were seen running from the scene shortly after the shots were fired. On Friday, Jan. 26, members of the WPD Gang Unit, in possession of an arrest warrant for a man officers were familiar with, arrived at the address where the wanted person was last known to live. As officers covered all corners of the building, one saw a man inside holding a gun. The officer recognized Daniel Silverio, 20, of 22 Dover St., Worcester, and knew he did not have a gun license. The officers in the front were greeted by the wanted male just as they approached the door. More about him later. An officer entered through the back unlocked door and observed Silverio running into the bathroom and securing the door behind him. The officer immediately forced open the bathroom door, grabbed Silverio’s hands and the firearm, a loaded Smith & Wesson .40 caliber handgun, dropped into the sink. Silverio was arrested on multiple gun-related charges. The man gang officers were there for initially informed them that he had addressed the warrant and supplied officers with a notice of warrant cancellation that was issued from the courthouse. He was not arrested. On Thursday, Jan. 25, a Worcester Police officer working out of the Operations Division was on routine patrol in Main South. At about 2:30 a.m., a white 2014 Toyota Camry strayed over the centerline. The officer stopped the car at 884 Main St. The driver, Gregucci Poitevien, 24, of 75 Purchase St., Worcester, was arrested for operating a car with a suspended license. A search of the car produced 36 small individually wrapped plastic baggies that contained cocaine, and 28 small individually wrapped plastic baggies that contained crack cocaine. Total weight of the recovered narcotics was 19.7 grams. The officer seized the cash as an asset forfeiture, and seized the drugs as evidence and sent them out to an area lab for analysis. A 51-year-old Webster man died and second person sustained serious but non-life-threatening injuries in a crash at approximately 6:55 a.m. Jan. 27 in Leicester. The crash was a head-on collision on Route 56 near King Street, Leicester Police Chief James Hurley said. A 2008 Nissan went off the road and partially rolled over. The operator of that vehicle, Todd E. Williams, 51, of Webster, was removed from his vehicle and transported to St. Vincent Hospital, where he was pronounced dead. Anthony D. Vickers Jr., 51, of Rochdale, the operator of a 1993 Cadillac, was transported to UMass Memorial Hospital’s University Campus with serious but non-life-threatening injuries. On Wednesday, Jan. 31, the Auburn Police Department said it had responded to two reports in the last 24 hours of counterfeit $100 bills being passed at local businesses. The bills are high-quality counterfeits and were designed to defeat the normal safeguards employed by most outlets. Auburn said it appears that the bills may have been passed by one or more black males in their 20s from Brooklyn, N.Y.
On Thursday, Feb. 1, a state law prohibiting bump stocks and trigger cranks went into effect. The law, which was passed in November, makes it illegal to possess bump stocks or trigger cranks — devices that increase a firearm’s rate of fire — under all circumstances, even in a private home. The possession ban is the second stage of the law to go into effect. The first stage, which went into effect on Nov. 3, 2017, made it illegal to sell or transfer ownership of bump stocks and trigger cranks. Anyone with one of these items faces prosecution. The former director of the Stevens Memorial Library in Ashburnham pleaded guilty on Jan. 29 to stealing more than $50,000 from the library. Paul-Bradley pleaded guilty to embezzlement by a municipal official, two counts of forgery and two counts of uttering false writing. The thefts occurred between March 2010 and July 2014.